Mello, aka WW's Carmelapple, is a 7-year-old red male born June 2, 2005. His sire is Mulberry Memory and his dam is WW Apple Butter. Mello has 57 races to his credit on Greyhound-data.com, starting at Derby Lane on January 1, 2007 and finishing at Wheeling Downs on October 13, 2007. 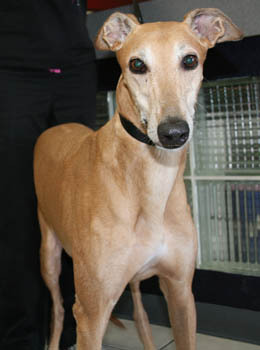 After retiring from racing, Mello found a home through another adoption group. But several years later, his family has surrendered him to GALT to find a home without small children where he will be happier. Mello is not cat tolerant.